As the EU emerges from this decade of crisis, it is clear that an open and frank debate within and between member states – on the issues that concern them most and spark the deepest divisions – is essential. It enables the development of responses that reflect the interests of all EU countries. It can also help to restore a sense among the elite and the public that belonging to the Union is still good for them and their countries – and is equally beneficial for all member states. That is what the New Pact for Europe project has been all about: providing a platform for and fostering such debates, and exploring how the major challenges facing Europe are interconnected. It can also help to deliver solutions that will demonstrate that EU membership is still a win-win for everyone– not for the sake of the EU project itself, but for the sake of the citizens whom it exists to serve. That process has led to the current report, which reflects the differences of perception, experience and current concerns to elaborate the key elements of an ambitious but realistic package deal. This comprehensive bargain - which covers the economic and social, migration, and security fields - could provide a basis to re-energise and galvanise support for the EU. Transatlantic Relations: Converging or Diverging? The report makes the case that while the transatlantic relationship may currently be traversing a period of divergence, this need not lead to a structural split over the longer term. Notwithstanding the present choppy waters, the fundamentals in relations between the US and Europe remain strong, and the prospects are mostly positive. 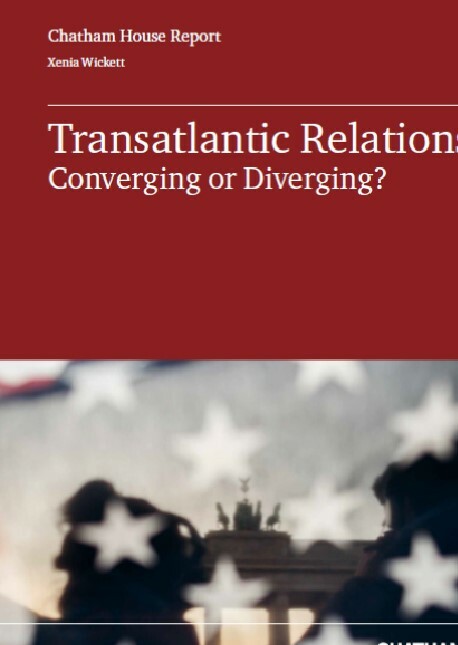 Read more about Transatlantic Relations: Converging or Diverging? Preparing Europe for the next 25 years is a contribution from the Secretary General of the European Parliament to the European Strategy and Policy Analysis System (ESPAS). ESPAS provides a framework for cooperation and consultation at administrative level, on a voluntary basis, between the European Parliament, the European Commission, the Council of the European Union, and the European External Action Service, with the Committee of the Regions and the European Economic and Social Committee as observers, to work together on medium and long-term trends facing or relating to the European Union. The purpose of this report is to provide a comparative perspective of China’s ‘One Belt, One Road’ initiative (OBOR), as seen from the various European Union (EU) member states. The Chinese leadership officially launched this framework in autumn 2013, presenting it immediately as a key national concept and foreign policy priority for the years to come. Yet OBOR is not a formal policy or a well-defined strategy, but rather a very broad conceptual framework for policies that aim at contributing to greater economic integration within Asia, between Asia and Europe, and between Asia and Africa through a diversity of activities and projects. At the heart of OBOR is a strategic approach to infrastructure development in a very broad sense. Accordingly, China’s first action plan on OBOR1 identified transport, energy and telecommunication infrastructure as priorities. The challenge of resilience in a globalised world discusses the concept of resilience from different perspectives and the role of science in the continuous process of building a resilient, stable, competitive and prosperous Europe. Resilience is a fundamental prerequisite for Europe as the largest integrated economic area in the world and has an important social dimension which requires the active cooperation of all stakeholders; citizens, the private sector, governments and NGOs included. 25 millions de kilomètres carrés, du pétrole, du gaz et de très nombreuses autres ressources minérales situées dans une zone qui pourrait être au cœur du trafic maritime mondial dans quelques décennies, l’Arctique est une zone critique de la géopolitique mondiale du 21e siècle. Dès lors, quelle place et quelle stratégie pour l’Union européenne dans cet espace ? Le rapport disponible ci-dessous a vocation à établir une description de la situation géostratégique et des grands enjeux de cette région ainsi qu’à mettre en perspective le rôle que l’Union européenne pourrait jouer dans les prochaines années. During the last decades, global interest for the Arctic, an area of 25 million square km of which 14 million for the Arctic ocean, increased due to the climate change which led to the melting of the ice cap and the thawing of the permafrost. The attention of the global players is attracted not only by energy and natural resources but also by new maritime routes. This creates new environmental challenges and leads to potentially dramatic changes to international trade, which will contribute to the globalization of this area. This evolution is one of the reasons for the growing interest of the large global players for the governance of this area, in the first place of which the People’s Republic of China, India or Singapore. These changes went not unnoticed by the EU, which, as early as 2002 under the Danish presidency of the Council, showed its intent to be a global actor by introducing the concept of “Arctic window” into its Nordic dimension. As reaffirmed in a resolution of the European parliament in March 2014, this concern was endorsed last May by the foreign affairs Council, which considered that Europe should reinforce its contribution to the Arctic cooperation. It pleads “for an active commitment of the EU with its Arctic partners in view of meeting the challenges of sustainable growth, in a prudent and reasonable way”. For many years now the Committee of the Regions has been building a reputation of being "the EU's Assembly of Regional and Local Representatives". It decided to contribute to the debate on metropolitan governance by pulling resources together with a long-standing international partner like the Forum of Federations (FoF). The going together with such a renowned global academic network on federalism in this project, provided the CoR with an unprecedented mix of analytical and policy expertise on urban and metropolitan issues to be able to offer to our members and the rest of the EU institutions. "This paper provides a concise analysis of the potential impact of globalisation on regional income disparities in Europe and of the role of neighbouring countries in this process in the period up to 2020. The analysis is part of a broader project of DG REGIO, which, together with the World Bank and the Bertelsmann Foundation, has established the Regional Future Initiative, a network of experts looking at the future of regional trends. The objective of the network is to analyse and build a consensus on the future impacts of key challenges (globalisation, climate change, demographic change and migration, energy risks and social polarisation) that regions will face in the perspective of 2020 and to elaborate and discuss possible responses. The output of the network should provide a basis for policy discussion and choices in the coming years. The paper is based upon a new analysis produced by the Regional Future network itself as well as prior research by international institutions and scholars. The project covers 5 challenges and the discussion of each challenge has been designed to avoid overlaps so far as possible. In the final phase the analysis of each challenge will be merged to produce two broad scenarios for European regions in 2020. (...) After a review of relevant literature and hypotheses, the paper proceeds to examine the characteristics and dimensions of globalization as it affects Europe and neighbouring regions. The analysis focusses on countries first and then on regions (NUTS2). At the country level, the scope of the analysis is wider and benefits from the extensive availability and reliability of national data. The more limited availability of data at the regional level narrows down the scope of the exercise but nevertheless allows us to point out peculiar geographical patterns which are particularly relevant to cohesion. The country-level analysis of globalisation (§ 2.1-2.2) provides a basis for examining the strength of individual Member States in different branches of trade (manufactures, services, raw materials and energy etc.) and other external income sources. A set of indicators is then used to calculate an index of sensitivity of individual regions in the face of globalization opportunities and pressures (§ 2.3). Three groups of regions are identified on the basis of this index: highly beneficiary, intermediate and vulnerable regions. The final chapter looks forward to 2020 and considers prospects for European countries under two different scenarios for the world economy and European economy as a whole (§ 3.1-2). 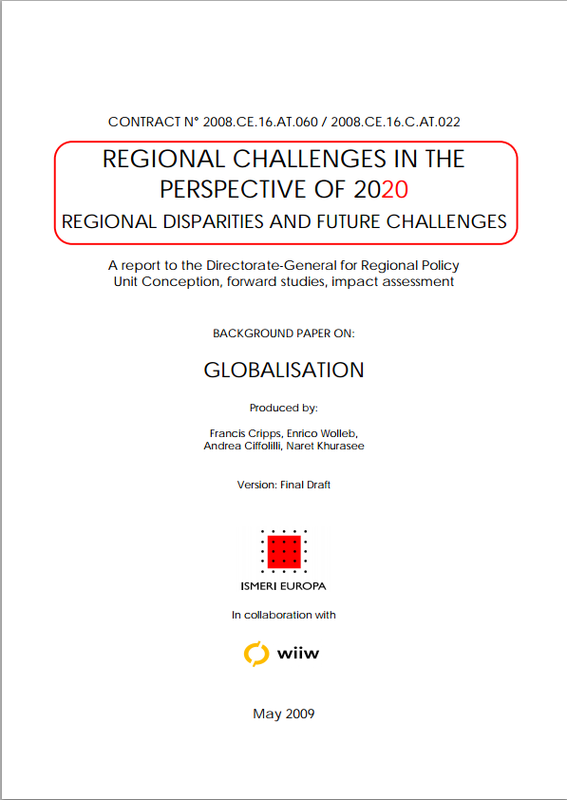 Finally, by combining insights stemming from the country-level analysis and the index of regional sensitivity the paper assesses the potential impacts of globalisation on regions in 2020 (§ 3.3)".